In these newly collected essays, interviews, and speeches, world-renowned activist and scholar Angela Y. Davis illuminates the connections between struggles against state violence and oppression throughout history and around the world. Reflecting on the importance of black feminism, intersectionality, and prison abolitionism for today's struggles, Davis discusses the legacies of previous liberation struggles, from the Black Freedom Movement to the South African anti-Apartheid movement. She highlights connections and analyzes today's struggles against state terror, from Ferguson to Palestine. 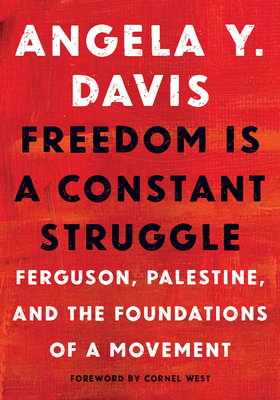 Facing a world of outrageous injustice, Davis challenges us to imagine and build the movement for human liberation. And in doing so, she reminds us that "Freedom is a constant struggle." Angela Y. Davis is a political activist, scholar, author, and speaker. She is an outspoken advocate for the oppressed and exploited, writing on Black liberation, prison abolition, the intersections of race, gender, and class, and international solidarity with Palestine. She is the author of several books, including Women, Race, and Class and Are Prisons Obsolete? She is the subject of the acclaimed documentary Free Angela and All Political Prisoners and is Distinguished Professor Emerita at the University of California, Santa Cruz. One of America's most provocative public intellectuals, Dr. Cornel West has been a champion for racial justice since childhood. His writing, speaking, and teaching weave together the traditions of the black Baptist Church, progressive politics, and jazz. The New York Times has praised his "ferocious moral vision." His many books include Race Matters, Democracy Matters, and his autobiography, Brother West: Living and Loving Out Loud. Frank Barat is a human rights activist and author. He was the coordinator of the Russell Tribunal on Palestine and is now the president of the Palestine Legal Action Network. His books include Gaza in Crisis and Corporate Complicity in Israel's Occupation. Angela Y. Davis is a political activist, scholar, author, and speaker. She is an outspoken advocate for the oppressed and exploited, writing on Black liberation, prison abolition, the intersections of race, gender, and class, and international solidarity with Palestine. She is the author of several books, including Women, Race, and Class and Are Prisons Obsolete? She is the subject of the acclaimed documentary Free Angela and All Political Prisoners and is Distinguished Professor Emerita at the University of California, Santa Cruz. One of America's most provocative public intellectuals, Dr. Cornel West has been a champion for racial justice since childhood. His writing, speaking, and teaching weave together the traditions of the black Baptist Church, progressive politics, and jazz. The New York Times has praised his "ferocious moral vision." His many books include Race Matters, Democracy Matters, and his new autobiography, Brother West: Living and Loving Out Loud. Frank Barat is a human rights activist and author. He was the coordinator of the Russell Tribunal on Palestine and is now the president of the Palestine Legal Action Network. His books include Gaza in Crisis and Corporate Complicity in Israel's Occupation.